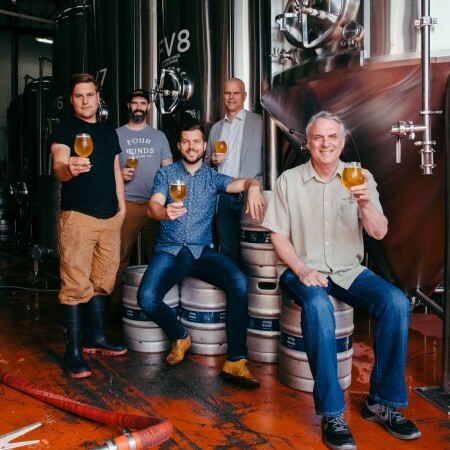 DELTA, BC – Four Winds Brewing has announced plans to open a second location in Southlands, a new farmlands community being established in the Tsawwassen area of Delta, BC. The new facility will be over 30,000 square feet, and will feature a restaurant and production brewery. As the Southlands project will include 300 acres of farmland, the brewery plans to grow hops, grains, and other ingredients to be used in its beer and kitchen. While zoning for the development already includes approval for a brewpub, the proposed Four Winds project exceeds the originally planned size and scope, so a request for zoning modifications will be filed with the city of Delta by Four Winds and Southland developers Century Group. A public meeting and information session on the proposal will be taking place at the South Delta Recreation Centre on Thursday, November 29th from 5:00 to 8:00 PM. More murky than hazy. Flavour is a bit muddled at first, but some nice fruit notes - peach, pineapple, mango - come through as it opens up. I question the Session IPA classification given the fairly low IBU, but this is still a more than acceptable pale ale. A modern classic of the IIPA style, at least in Ontario. Strong malt base supporting a blast of citrus, pine & tropical fruit hops. The Motueka hops are similar enough to Saaz to fit this excellent Pils, but also have a citrus zest character that adds a unique edge. Strong fruit preserve notes - esp. pineapple & peach - that lean a bit sweeter than my preference, but still improved from early days.